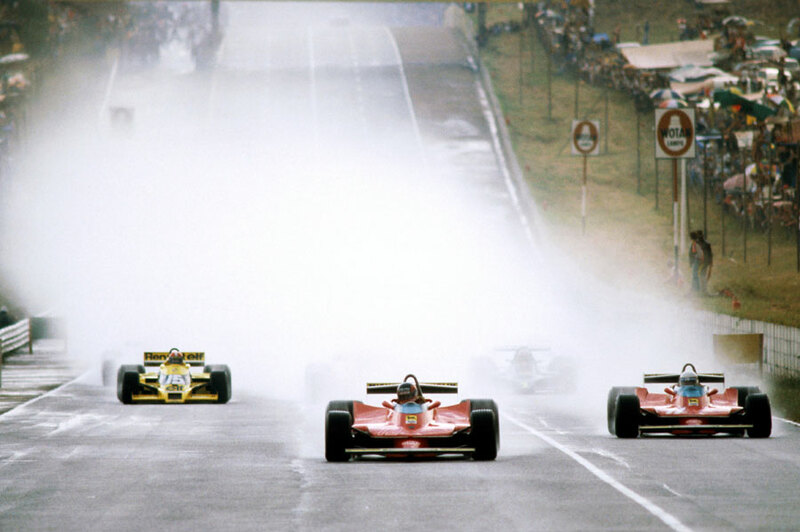 All eyes were on the Ligiers after their dominance of the opening two races, but it was Gilles Villeneuve who steered his brand new Ferrari to victory - his second win in four outings - at Kyalami. Practice had been all about tyres as the cars on Michelins kept those on Goodyears at bay. Jean-Pierre Jabouille's Renault took pole ahead of the new 312-T4 Ferraris of Jody Scheckter and Villeneuve, with the Ligiers of Patrick Depailler and Jacques Lafitte nestled on the third row. The consensus was that the Michelins would not cope with the fierce heat, while the thin air - Kyalmi is 5000 feet above sea level - would be a real boost for the turbocharged Renaults. There was also drama when Didier Pironi lost the rear wheel of his Tyrrell at 140mph, and careered through a catch fence into a wall. He escaped with a cut lip and a bashed helmet. The Renaults were outpaced off the line, but all the planning went out the window when a thunderstorm drenched the track within the first two laps and the race was stopped. When it re-started an hour later, with the track still damp, Scheckter and Depailler gambled on starting on dry tyres, believing any early disadvantage would be offset by having one less pit stop. The strategy backfired on Depailler, who slid off, but Scheckter drove brilliantly to ease into second behind Villeneuve on his wet-weather tyres. "He was astounding," said Lotus team manager Nigel Bennett. "He drove as fast on dry tyres as everyone else on wet tyres. Incredible." Scheckter shot past Villeneuve when he pitted, but faster-than-expected wear on his Michelins forced him to make a tyre change and from then on he was chasing his team-mate, cutting the deficit from 30 to three-and-a-half seconds by the close. "Jody deserved to win," admitted Villeneuve, while Scheckter ruefully admitted: "I went too hard at first, I stayed out too long. I should have come in and changed [the tyres] earlier." James Hunt, whose move to the uncompetitive Wolf when a Ferrari deal had been his looked a terrible choice, showed natural skill and remained undiminished as he battled through the field to finish eighth. Both Ligiers were sidelined after accidents.